Stunned villagers watched a large slice of their historic clifftop community get swallowed by the sea at the weekend. It was a table top exercise projected on to a screen in the sanctuary of the parish church at Overstrand. But the prospect of homes and businesses being lost to coastal erosion could become a chilling reality if a controversial new sea defence strategy gets the go-ahead. A draft shoreline management plan (SMP) from Kelling to Lowestoft Ness has already sparked anger by seeking to abandon many long-standing sea defences to create a more natural coastline – but at the high price of losing £250m worth of property. More than 250 Overstrand residents attended the meeting to find out how it affected them, their homes and their businesses. They were told their picture postcard village had become a carbunkle promontory, which needed to be planed off the map to allow sand to reach beaches further round the coast. Local streets are lined with fine villas and houses from the Victorian heyday of a place tagged the village of millionaires, whose VIP visitors have included Sir Winston Churchill. But the sea defences which have shored up the soft cliffs beneath architectural gems are set to be sacrificed under the new SMP. Over the next 100 years it would see Overstrand lose up to 135 homes and 10 commercial properties, including a pub, hotel, and caravan park. Erosion lines drawn on to a street map starkly showed the sea chewing off a large chunk of the historic heart of the village stretching back from its popular clifftop café. Among those raising concerns were Robert and Lorraine Love, of Fakenham, who said they had bought a £167,000 building plot at Paul’s Lane, where they hoped to build their dream home but now wondered if it had become a white elephant. He said experts reckoned Overstrand’s defences were stopping 20pc of sediment moving along the coast, where it was needed to bolster other beaches. They advocated returning to natural processes, but Mr Kerby said: “That would be OK if they had not interfered 50 years ago. Not to do so now was a breach of their human rights. Mr Kerby said the plan was a “carve up” rooted in the Government’s unwillingness to spend money on coastal defences – as evidenced by next year’s £570m flood and coastal spending, with £47m going to sea defences. A show of hands indicated huge opposition to the SMP. 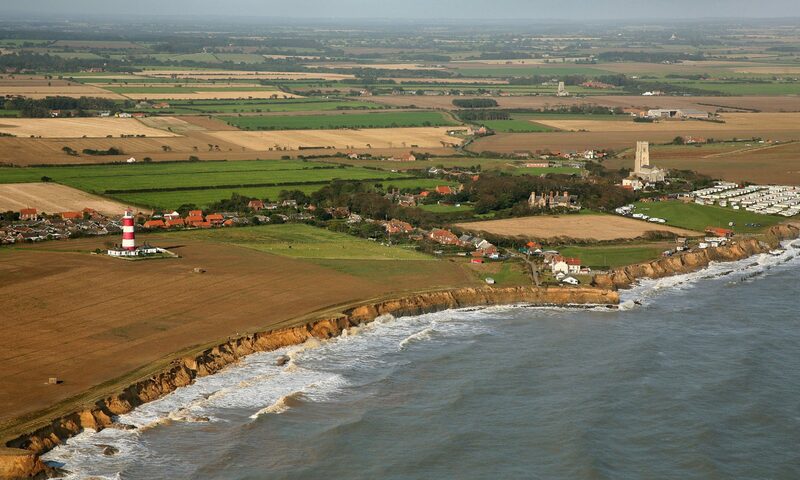 After the meeting, North Norfolk MP Norman Lamb said similar concerns had been raised at a recent meeting in Mundesley – another well-established holiday village whose defences were set to be eroded under the plan. Yesterday Cliff Top Café customers said they were appalled at the plans to abandon defences, and were signing a petition on the counter. Mr Kerby said while the CCAG home village of Happisburgh was used to years of fighting for defences, it was new to Overstrand and Mundesley – and quite a shock for the residents.